King of Syria; born about 242 B.C. ; reigned from 223; died 187. Eleven verses of Daniel (xi. 10-21) are supposed by critics to refer to the wars and fate of this monarch, who was the first Greek ruler to exercise considerable influence on both the internal and external affairs of Palestine. He was accordingly the first Seleucid to occupy the attention of Jewish historians, both Palestinian and Alexandrian; and the first book of the Maccabees (vii. 6), as well as Josephus, who draws upon older Jewish-Hellenic sources, devotes considerable attention to this monarch. It was through him that Judea's long and peaceful quietude amid constant warfare all around, from the days of the Persians down to Antiochus, was interrupted. About 218 B.C. the Jews were made to feel what it was to be the bone of contention between two powerful neighbors. Antiochus considered Palestine as a portion of his Seleucid dominion, invaded the land, and seized a large number of its fortified places. A great number of the Jews were of the opinion that Seleucid rule was to be preferred to the Egyptian, since the yoke of Egypt had been severely felt in recent years in the shape of the pitiless taxation of the Tobiads. The Tobiad family naturally favored Egypt, and through their influence Jerusalem did not fall into the power of Antiochus. But when Antiochus vanquished the Egyptian general Scopus at Paneas in northern Palestine (198), the gates of Jerusalem were opened to the conqueror by its citizens, who likewise rendered valuable assistance in the subsequent siege of the citadel while it remained in Egyptian hands. In the interval between Antiochus'entry into Palestine (218) and the formal incorporation of the country with the Seleucid empire (198), Judea was, as Josephus says, like a storm-tossed ship on the ocean. Silver Coin of Antiochus III. Obverse: Head of Antiochus, diademed. Reverse: BAΣIΛEΩΣ ANTIOXOY; an elephant. (After Gardner, "Catalogue of Seleucid Coins. ")Decrees of Antiochus. In addition to the turmoil of war, there arose in the Jewish nation pro-Seleucid and pro-Ptolemaic parties; and the schism exercised great influence upon the Judaism of the time. 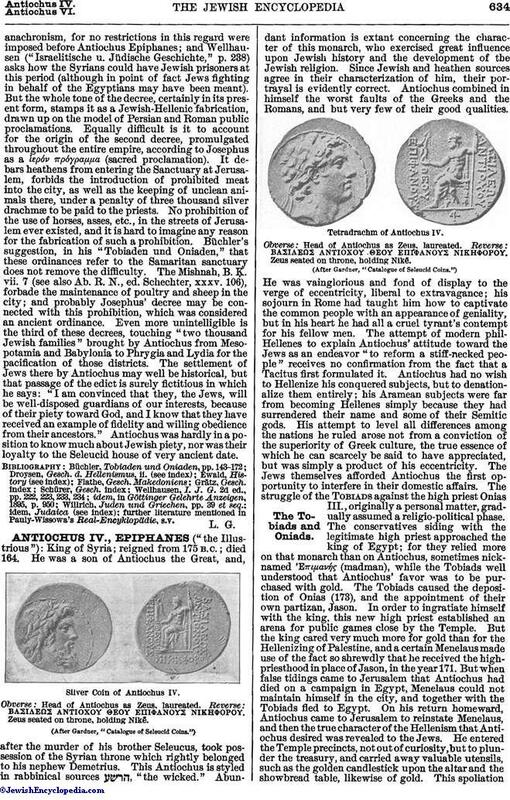 It was in Antioch that the Jews first made the acquaintance of Hellenism and of the more corrupt sides of Greek culture; and it was from Antioch that Palestine henceforth was ruled, although the defeat of Antiochus by the Romans at Magnesia (190) materially crippled his power. The source of information concerning the attitude of this Seleucid toward the Jews is Josephus, but unfortunately his accustomed desire to represent all great rulers as friendly to the Jews has led him to incorporate in his history much that is legendary. He mentions three decrees issued by Antiochus concerning the Jews. In the first, addressed to an unknown Ptolemy, the king lauds the Jews, and in recognition of their merits he grants them freedom of religious worship and practise, immunity from taxation for all elders, priests, Templescribes, and singers, and for all who settled in Jerusalem before a certain time. The attitude of Antiochus was especially favorable to the Temple. Such things as wine, oil, incense, wheat, wood, salt, etc., that were needed for sacrificial use, were to be supplied at the king's expense. The decree closes with the king's command to his general to set free all Jewish prisoners. Objections raised to individual provisions of this decree are not sufficient to prove it spurious; the assurance of free religious practise suggests ananachronism, for no restrictions in this regard were imposed before Antiochus Epiphanes; and Wellhausen ("Israelitische u. Jüdische Geschichte," p. 238) asks how the Syrians could have Jewish prisoners at this period (although in point of fact Jews fighting in behalf of the Egyptians may have been meant). But the whole tone of the decree, certainly in its present form, stamps it as a Jewish-Hellenic fabrication, drawn up on the model of Persian and Roman public proclamations. Equally difficult is it to account for the origin of the second decree, promulgated throughout the entire empire, according to Josephus as a ἱερόν πρόγραμμα (sacred proclamation). It debars heathens from entering the Sanctuary at Jerusalem, forbids the introduction of prohibited meat into the city, as well as the keeping of unclean animals there, under a penalty of three thousand silver drachmæ to be paid to the priests. No prohibition of the use of horses, asses, etc., in the streets of Jerusalem ever existed, and it is hard to imagine any reason for the fabrication of such a prohibition. Büchler's suggestion, in his "Tobiaden und Oniaden," that these ordinances refer to the Samaritan sanctuary does not remove the difficulty. The Mishnah, B. Ḳ. vii. 7 (see also Ab. R. N., ed. Schechter, xxxv. 106), forbade the maintenance of poultry and sheep in the city; and probably Josephus' decree may be connected with this prohibition, which was considered an ancient ordinance. Even more unintelligible is the third of these decrees, touching "two thousand Jewish families" brought by Antiochus from Mesopotamia and Babylonia to Phrygia and Lydia for the pacification of those districts. 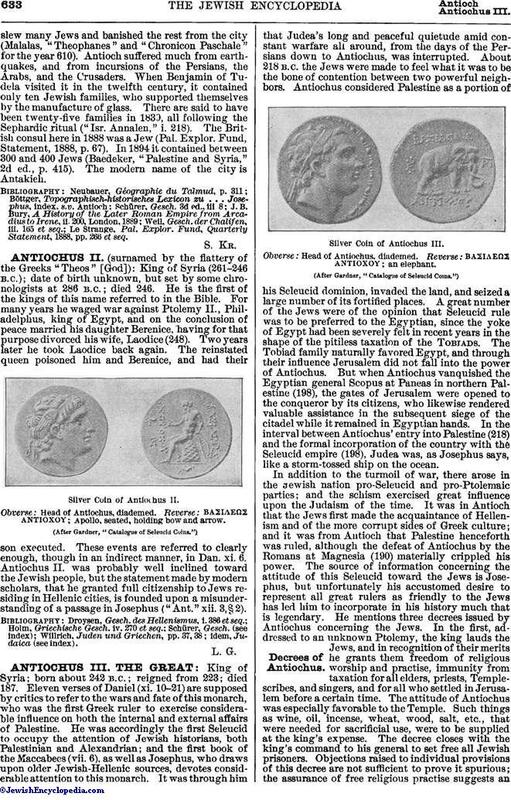 The settlement of Jews there by Antiochus may well be historical, but that passage of the edict is surely fictitious in which he says: "I am convinced that they, the Jews, will be well-disposed guardians of our interests, because of their piety toward God, and I know that they have received an example of fidelity and willing obedience from their ancestors." Antiochus was hardly in a position to know much about Jewish piety, nor was their loyalty to the Seleucid house of very ancient date. further literature mentioned in Pauly-Wissowa's Real-Encyklopädie, s.v.